Venezuela’s central bank (BCV) first-quarter GDP report shows an accelerating recovery: GDP grew 4.5% over its first-quarter 2010 level. For a closer look at the most recent quarter, we need seasonally adjusted data so we can compare it to the quarter just before it. The central bank’s seasonally-adjusted series ends the third quarter of 2010, but we can estimate it more recently, using the same adjustment that the BCV uses. Two methods are shown here: first, a simple adjustment of the official, unadjusted GDP series, and second, the sum of the adjusted industry-specific GDP levels. The figure below shows the results of these estimates: first quarter GDP grew by either 9.8% or 9.6% on an annualized basis, depending on which adjustment method we use. 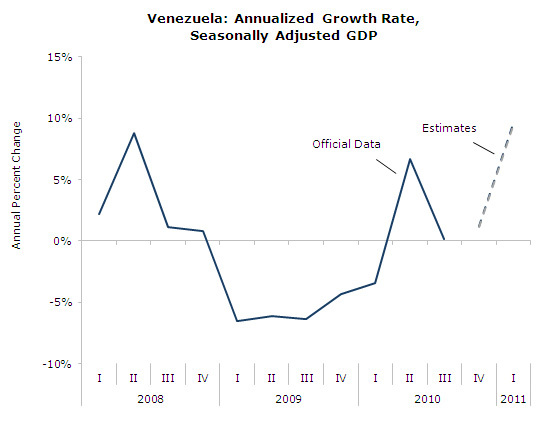 For more on Venezuela's GDP, check out the latest Latin America Data Byte.